According to data from the Brazilian Tree Industry (IBÁ), there are 5.6 million hectares (13.8 million acres) of planted eucalyptus trees in Brazil. 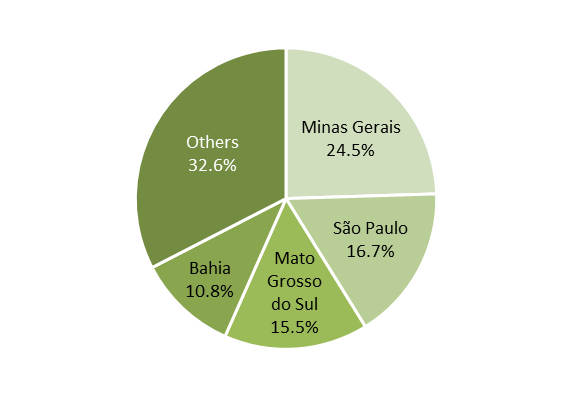 A significant portion of this total—nearly 25 percent—is located in the state of Minas Gerais, followed by São Paulo at 16.7 percent and Mato Grosso do Sul at 15.5 percent (Figure 1). The forestry sector of Minas Gerais is focused on the production of coal to service the steel industry, as well as the production of pulp; the state is home to global pulp producer Cenibra in Belo Oriente. However, the pulp industry is also thriving in the neighboring state of Mato Grosso do Sul, which is home to Fibria (now Suzano) and Eldorado in Três Lagoas. While Mato Grosso’s 185,000 thousand hectares (457,000 acres) of planted eucalyptus may seem small compared to Minas Gerais, a recent study conducted by Forest2Market do Brasil determined that there is significant potential for expansion of this market, which is driven by the region’s agricultural sector (grain drying) and bioenergy power generation. 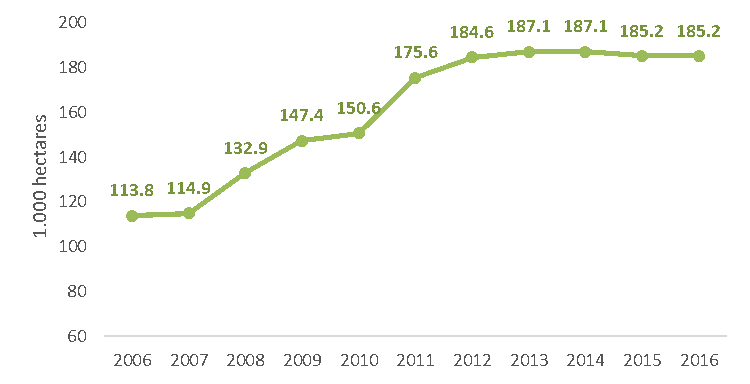 Over the last 10 years, in fact, the area of planted eucalyptus in Mato Grosso do Sul has grown 63 percent (5 percent per year) (Figure 2). Mato Grosso's agribusiness is booming, as the state ranks first in Brazil’s soybean production with 30.5 million tons produced in 2017 according to data from the Brazilian Institute of Geography and Statistics (IBGE). These soybean producers use eucalyptus fiber as wood fuel to dry their soybean crop and the outlook for additional regional growth in the sector is quite strong; The Institute of Mato Grosso of Agricultural Economics (IMEA) projects production of 46.2 million tons of soybeans in the state by 2025. 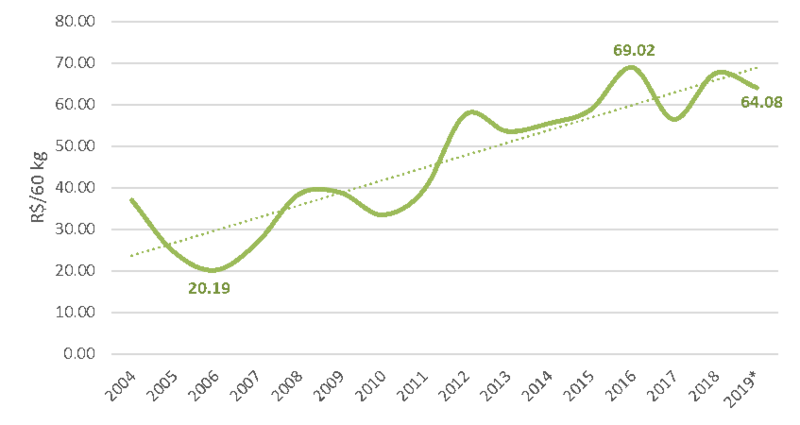 The figure below suggests that there will also be an increase in price with the increase in soybean production. During its research in the southern region of the state, Forest2Market do Brasil observed that some of the major industry players are planning expansions, and there is also the possibility of a new regional bioenergy power plant coming online in the near term. These developments would create a significant increase in demand for the eucalyptus resource in Mato Grosso—approximately 923,000 cubic meters (m³) of additional demand per year.